Finished size: The size depends on your hook size and yarn thickness. 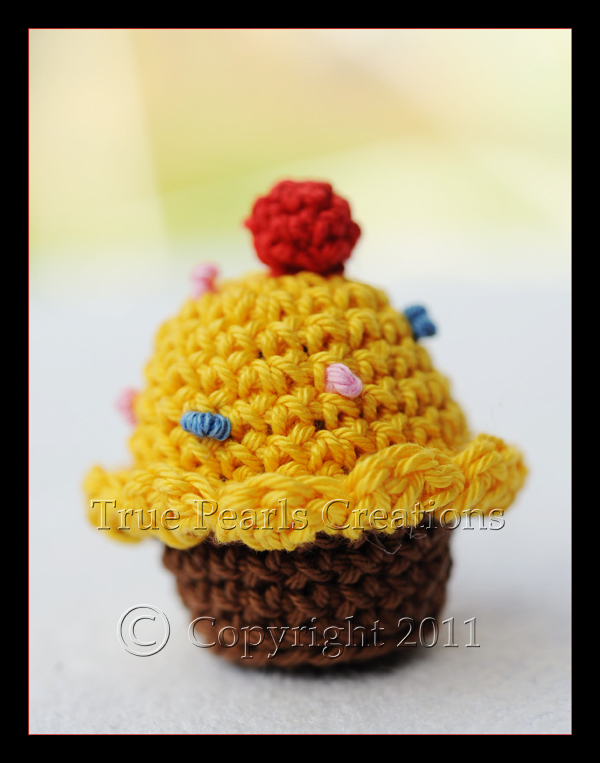 I used a 4mm hook and 4ply 100% cotton yarns, so my cupcake approx. 5.5cm (2inches). Notes: I started the cupcake with the magic loop/adjustable ring. (video tutorial here) The cupcake is worked in continuous rounds, do not join and do not turn at beginning of rounds. A stitch marker is used to indicate the beginning of rounds. Move marker up as each round is completed. Begin to stuff and continue until the cupcake is complete. Fasten off, leaving a long tail. Loop through into the 6 stitches, pull and make a knot. Weave in ends. With yellow yarn, make a slip knot and hook trough the first stitch on the brown and the yellow edge, ch1. Fasten off, leaving a long tail. Loop through into the 3 stitches, pull and make a knot. Stitch on top of cupcake. Make more french knot (video tutorial here) everywhere on the yellow part from different type of coloured yarn or stitch on beads. I apologize for any mistakes, please contact me if you find any. Thank you! Please leave a comment if you use my pattern! This pattern is an original pattern by Adrienn of TruePearlsCreations (January 2011). Please do not claim this pattern as your own. If you wish to share this pattern, you must link my blog. The pattern only for NON COMMERCIAL USE.